We played a 4 game set in New Hampshire last week. Winning 3 out of 4 was a nice feeling, but it wasn't the highlight of the trip. Seeing Roger Clemens at the field was a surprise as well, but still, not the most outstanding memory of Manchester, NH. After the first batter of the game popped up to center field, I saw something I will never forget...Ollie the bat dog. It kind of shocked me as I saw the blonde canine trotting up to the plate. He sniffed the bat a little bit, as if to make sure it was up to MiLB regulations, then chomped down on the barrel just below the label. I suppose that he has been trained to feel the geometric weighted center of the bat so that it remains balanced in his mouth as he retrieves it. Ollie dropped the bat on queue at the trainer's feet, sat down facing home plate and waited for his treat. He was better at his job than most human bat boys. It was amazing! 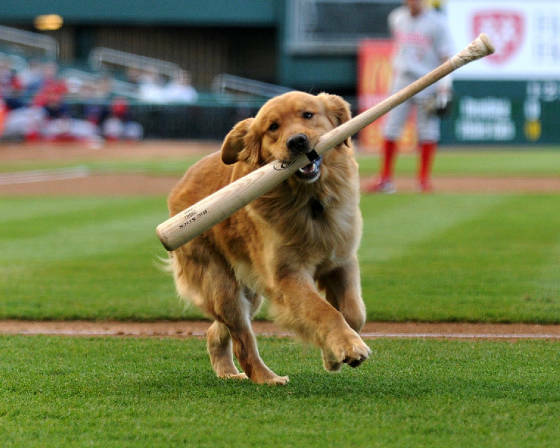 But i guess I shouldn't be too surprised at his bat retrieving prowess as he is the son of the Trenton Thunder's bat dog, Chase. I realize that I shouldn't be in favor of nepotism in the bat dog industry, but they're so darn cute. 1) Slobber replaces pine tar as primary bat condiment. 2) Batters not only compare ball marks on bats, but teeth marks too. 3) Retrieving foul balls gets more entertaining, but now requires a game of tug-o-war upon completion. 4) Expect broken bats to be handled with much more care...and confusion. 5) Umpires have to carry Doggy doo-doo bags for when nature calls. 6) David sunflower seeds comes out with new line of salty shelled dog treats. 7) Bring-your-dog-to-the-park day raises a whole new set of issues. Including canine jealousy. 8) No longer have to worry about cats, squirrels, or any other varmints entering the field of play. 9) Dog Fashion designers have to team up with Majestic to make authentic on-field jerseys in dog sizes. 10) Chatter from the dug out would get a little "ruff"er (I'm sorry). That's just a few. If you've got some thoughts, let me know what you think! For making the dog trained for you, you must have to find the best man for your dog training and this online website dogpeer.com.au is the place from where you will get the person which will train your dog easily. When my kids were young we were always playing baseball. We had this orange woodchuck cat that came to us as a stray. He loved baseball. Every time we played, he would walk out to the field and plop down somewhere in the field of play, claiming that real estate as his own. He's always stay until the session was done. I think you've got tons to brag concerning! and that i would not worry about being "overly boastful" as a result of you are tooting your own horn! i favor to listen to the great stuff that individuals do. It's far better than hearing the long list of crap and ailments they're experiencing over ... and over ... and once again. Hearing unhealthy stuff all the time is simply not smart. Someone recently wrote, "What kind of a mad god would create such a demonical mess in the world as what we have today?" The remark came in response to tragedies from the Sudan, Thailand and other places. The real problem with this question is that it's directing the responsibility for this world's horrors at God -- when, actually, someone else is to blame. But in the end, if one choses to relate to God in the right way, He will restore life to its fullest potential for anyone who so chooses. Really Actually In fact Truly Genuinely no matter if when someone doesn't understand know be aware of then after that afterward its up to other users people viewers visitors that they will help assist , so here it happens occurs takes place . This new dog wasn't aggressive or an issue for any dog in our pack, but the whole pack sensed it was not to be 'messed with' not to be challenged to play without potential consequences. CBD has been very effective for the entire health of your dog and certain medical conditions. Even if your best friend does not have a specific condition, it is good to give him CBD as a prevention or just as a daily supplement. However, CBD can only be used for the treatment of a certain condition or as an incentive for other medications for a number of different conditions and symptoms. Efficiency doesn’t take a back seat, though, and Ford claims this Mustang can return 32 mpg on the highway. Its only downside as a sports car is the fact that the turbo four-pot doesn’t really sound that exciting, but Ford has fitted it with augmented engine noise Agen Judi that is pumped into the cabin - some may not agree with this practice, but it’s there and you can quite easily notice it.